THE FURS THAT WILL NOT BE INCLUDED ARE SEALS, SPECIALS, AND ODDS AND ENDS. PLEASE CHECK OUT THE ODDS AND ENDS LINK FOR SPECIAL OFFERS. WE DO NOT SELL WHOLESALE-WE ARE RETAIL ONLY AND WE DO NOT SELL OR SHIP ROLLS OF FUR-WE SPECIALIZE IN SMALL YARDAGE ORDERS THUS THE LOW MINIMUM ORDER OF A HALF YARD TO USA BUYERS AND ONE YARD TO INTERNATIONAL BUYERS. MORE INFORMATION CAN BE FOUND THROUGHOUT THE WEBSITE BUT WE CANNOT SHIP ORDERS THAT NEED TO BE SENT ON ROLLS INSTEAD OF BOXES-ALSO, WE DO NOT KEEP HUGE AMOUNTS OF FURS IN STOCK AS WE HAVE SO MANY DIFFERENT FURS IT WOULD BE IMPOSSIBLE FOR US TO DO SO. AS ALWAYS WE ARE HERE TO HELP BUT WE JUST WANTED TO SPELL THIS OUT AS THERE HAS BEEN SOME CONFUSION REGARDING THIS PROTOCAL. WE ARE PUTTING THIS ON THE WEBSITE ONE MORE TIME AS WE ARE STILL GETTING CUSTOMERS WHO WANT US TO CHANGE THEIR PAYPAL SHIPPING ADDRESS AND WE CANNOT DO THAT. WE SHIP TO THE CONFIRMED ADDRESS THAT IS HOOKED UP TO THE PAYPAL ACCOUNT NO MATTER IF IT IS FOR A ZILLION DOLLAR ORDER OR SAMPLES. WE CANNOT CHANGE ADDRESSES SO PLEASE, PLEASE MAKE SURE THAT THE CORRECT SHIPPING ADDRESS SHOWS UP ON YOUR PAYPAL ACCOUNT AS WE CANNOT CHANGE IT AND OUR SHIPPER WILL SHIP TO THE ADDRESS THAT APPEARS WHEN THEY CLICK THE "PRINT SHIPPING LABEL" BUTTON. WE WILL NOT BE RESPONSIBLE FOR LOST ITEMS IF THIS ADDRESS IS NOT CORRECT AS IT IS THE RESPONSIBLITY OF THE CUSTOMER TO BE SURE THE CORRECT SHIPPING ADDRESS SHOWS UP ON THEIR ACCOUNT. PLEASE MAKE SURE BEFORE YOU PAY YOUR INVOICE THAT THE SHIPPING ADDRESS THAT SHOWS ON YOUR PAYPAL ACCOUNT IS THE CORRECT ADDRESS. THE SHIPPERS USE THE ADDRESS THAT THEY SEE ON YOUR ACCOUNT AS PROVIDED BY PAYPAL WHEN THEY ARE PREPARING YOUR ORDER. WE WILL NOT BE HELD RESPONSIBLE FOR ANY PACKAGE THAT DOES NOT GET DELIVERED DUE TO THE FACT THAT THE INCORRECT ADDRESS IS HOOKED UP TO YOUR ACCOUNT. WE STRONGLY SUGGEST SEEING A SAMPLE PRIOR TO ORDERING-THE PICTURES ON THE WEBSITE LOOK DIFFERENTLY ON EACH MONITOR SO SEEING A SAMPLE IS VERY IMPORTANT. WE DO OUR BEST TO DESCRIBE EACH FUR ON THE LISTING BUT WHAT WE SEE AND WHAT YOU SEE MAY BE TWO DIFFERENT THINGS SO PLEASE, PLEASE ORDER A SAMPLE-FURS ARE NOT RETURNABLE OR EXCHANGEABLE BECAUSE YOU DO NOT LIKE WHAT YOU ORDERED OR YOU DO NOT THINK IT LOOKS LIKE THE PICTURE ON THE WEBSITE!! ORDERING A SAMPLE IS ALSO IMPORTANT IF YOU ARE TRYING TO MATCH A FUR THAT YOU HAVE ORDERED BEFORE AS DYE LOTS CHANGE AS DOES THE COMPOSITION OF EACH FUR SO AGAIN, PLEASE GET A SAMPLE. Why don't we? Because there are just too many variables as to yardage amounts, discounts for larger orders, questions regarding the furs, etc. In the long run, a shopping cart would cause our prices to increase due to the constant paperwork, returns, restocking fees, etc. This is a very personalized business and while we understand that it is a great inconvenience not to be able to place your orders online via the traditional shopping cart, you can still utilize Paypal if you want to place an online order. Please check out the ORDERING INFORMATION paragraphs both on this page and on the link to the left. PLEASE INCLUDE YOUR FULL NAME AND ADDRESS IN THE EMAIL, THE EMAIL ADDRESS THAT IS HOOKED UP TO THE ACCOUNT ALONG WITH THE ITEM NAME OR NUMBER AND YARDAGE NEEDED. IF YOU ARE USING PAYPAL, THE ADDRESS HOOKED UP TO YOUR ACCOUNT IS THE ADDRESS WHERE THE PACKAGE IS GOING TO BE SHIPPED. THIS IS PART OF PAYPAL'S BUYER/SELLER PROTECTION POLICY-WE CAN ONLY SHIP TO THE ADDRESS THAT PAYPAL HAS ON FILE FOR YOUR ACCOUNT. WE DO NOT AND CANNOT CHANGE ADDRESSES SO IF YOU HAVE THE WRONG ADDRESS HOOKED UP TO YOUR PAYPAL ACCOUNT THAT IS A SHAME BECAUSE THAT IS WHERE YOUR PACKAGE WILL BE GOING. THIS INFORMATION IS THROUGHOUT THIS WEBSITE AND ON PAYPAL INVOICES SO FOR THOSE WHO HAVE SEEN THIS A ZILLION TIMES, WE ARE SORRY BUT IT SEEMS THAT MANY CUSTOMERS STILL ARE WANTING ADDRESS CHANGES AND THIS IS NOT GOING TO HAPPEN. PLEASE KEEP YOUR PAYPAL ADDRESS UP TO DATE-WE HAVE SEVERAL PEOPLE WHO DO THE SHIPPING AND WHEN THEY CLICK, THEY SHIP TO THE ADDRESS PRINTED ON THE MAILING LABEL AND WE WILL NOT OFFER A REFUND FOR LOST ITEMS DUE TO THE INCORRECT ADDRESS SHOWING UP ON THE ACCOUNT. THANK YOU-FOR ADDITIONAL INFORMATION PLEASE CHECK THE ORDERING INFORMATION LINK TO THE LEFT. UNTIL FURTHER NOTICE THE ONLY INTERNATIONAL COUNTRY WE WILL BE SHIPPING TO IS CANADA AND WE ARE USING UPS STANDARD SHIP. MORE INFORMATION CAN BE FOUND BY CLICKING THE INTERNATIONAL ORDERING TAB ON YOUR LEFT. WE ARE NOT RESPONSIBLE FOR ANY TAXES OR CUSTOMS FEES-THIS IS COMPLETELY THE RESPONSIBILITY OF THE BUYER. PLEASE CHECK WITH YOUR CUSTOMS DEPARTMENT BEFORE ORDERING-YOU WILL NOT RECEIVE A REFUND FROM US BECAUSE YOU DO NOT WANT TO ACCEPT DELIVERY OF YOUR PACKAGE. SAMPLES ARE STILL BEING SENT USING USPS PRIORITY MAIL OR FIRST CLASS MAIL TO CANADA ONLY! OF COURSE WE STILL SHIP THROUGHOUT THE UNITED STATES AS THERE SEEMS TO HAVE BEEN SOME CONFUSION ABOUT THAT. PLEASE TAKE A FEW MINUTES TO READ THE INFORMATION LISTED ON THIS PAGE AS IT WILL ANSWER MANY OF YOUR QUESTIONS. ALSO, THE COMMON QUESTIONS LINK HAS ADDITIONAL INFORMATION. ALL OF THE INFORMATION REGARDING HOW TO ORDER VIA PAYPAL, HOW TO ORDER USING A CREDIT CARD, MINIMUM QUANTITY YOU CAN ORDER AND A WHOLE BUNCH OF OTHER VERY COMMONLY ASKED QUESTIONS ARE ANSWERED BELOW. PLEASE READ THIS PAGE BEFORE CALLING AS WE ARE SURE YOUR QUESTIONS WILL BE ANSWERED BUT YOU HAVE TO READ THE PAGE. YOUR SHIPPING ADDRESS MUST BE THE ADDRESS THAT IS HOOKED UP TO YOUR PAYPAL ACCOUNT AS PER THE REGULATIONS STIPULATED BY PAYPAL-NO EXCEPTIONS!! OUR SHIPPERS WILL NOTCHANGE ADDRESSES! WE WILL NOT BE RESPONSIBLE FOR LOST ITEMS IF YOU DO NOT HAVE THE CORRECT ADDRESS HOOKED UP TO YOUR PAYPAL ACCOUNT NOR WILL BE BE RESPONSIBLE FOR SHIPPING TO AN OLD ADDRESS OR ANY OTHER ISSUES THAT COME FROM THE CORRECT SHIPPING ADDRESS NOT BEING HOOKED UP TO THE PAYPAL ACCOUNT. UPS SOMETIMES DOES THE ADDRESS CORRECTION ON THEIR OWN-IF THIS IS THE CASE--- IF UPS HAS TO DO AN ADDRESS CORRECTION YOU WILL BE INVOICED FOR THE $16.00 THAT UPS CHARGES FOR THIS SERVICE. IF YOU WANT TO PURCHASE AN ITEM AND THE BILLING ADDRESS WILL BE DIFFERENT FROM THE SHIPPING ADDRESS, PLEASE PHONE US AS THIS WILL NEED TO BE DONE BY CREDIT CARD. IF YOU WISH TO USE A CREDIT CARD CALL US AT 215-322-8946 AND LEAVE A MESSAGE ON OUR VOICEMAIL AND WE WILL CALL FOR CREDIT CARD INFORMATION. YOU CAN ALSO DOWNLOAD THE ORDER FORM AND EITHER EMAIL IT TO US, FAX IT TO US AT 215-396-9599, OR MAIL IT IN. IT IS REALLY NOT THAT DIFFICULT TO PLACE AN ORDER BY CREDIT CARD SO PLEASE JUST CALL OR EMAIL OR FAX OR WHATEVER IS EASIEST TO DO BUT THIS SHOULD TAKE CARE OF ANY ORDERING ISSUES. IF YOU WILL BE ORDERING BY MAIL-PLEASE LET US KNOW WHAT YOU ARE ORDERING AND THAT YOU WILL BE SENDING IN A MAIL ORDER-PLEASE DO NOT JUST SEND THE ORDER IN UNLESS WE KNOW BEFOREHAND-WE WILL MAKE A SPECIAL EFFORT TO GET TO THE PO BOX IN A TIMELY MANNER AS WE DO NOT GET TO THE POST OFFICE VERY OFTEN UNLESS WE KNOW THAT THERE IS SOMETHING FOR US. TO EXPEDITE ORDERS AND/OR ANSWER QUESTIONS, PLEASE INCLUDE YOUR PHONE NUMBER IN YOUR EMAIL SO IF WE HAVE A QUESTION THAT CANNOT BE ANSWERED VIA EMAIL WE WILL BE ABLE TO PHONE YOU. PLEASE MAKE SURE YOU INCLUDE THE EMAIL ADDRESS THAT IS HOOKED UP TO YOUR PAYPAL ACCOUNT AND DOUBLE CHECK THAT THE SHIPPING ADDRESS THAT IS HOOKED UP TO PAYPAL IS THE CORRECT SHIPPING ADDRESS. IF IT IS NOT, PLEASE CORRECT THE ADDRESS THAT IS HOOKED UP TO PAYPAL AS WE WILL ONLY SHIP TO THE ADDRESS SHOWING ON THE PAYPAL SITE. iF YOU ARE FAXING IN AN ORDER-PLEASE MAKE SURE YOUR EMAIL ADDRESS IS SOMEWHERE ON THE ORDER FORM SO WE CAN SEND YOU A CONFIRMATION OF DELIVERY. IF YOU CALL AND GET OUR VOICEMAIL, PLEASE LEAVE A MESSAGE AND YOUR CALL WILL BE RETURNED AS QUICKLY AS POSSIBLE. YOU EITHER DID NOT LEAVE A PHONE NUMBER OR YOUR CELL PHONE HAD BAD RECEPTION SO PLEASE TRY YOUR CALL AGAIN. 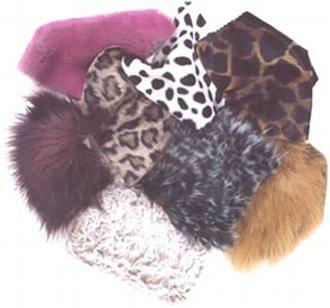 You are about to browse through some of the most wonderful fake fur fabrics on earth. We are constantly adding new furs, so please stop by often. This website lists most of the furs that we carry. We do have a few furs that are not listed because of limited yardage so if you do not see a fur that you need, please feel free to contact us. As you go through the website, you will more than likely want some fur samples. Please click SAMPLES on the website navigaton bar for complete ordering instructions. Please read the information before emailing us as your questions may already be answered. PLEASE READ OUR RETURN POLICY BEFORE YOU ORDER! IF YOU ARE TRYING TO MATCH A FUR YOU WILL NEED TO SEND US A SAMPLE-PLEASE DO NOT ASK US TO LOOK AT PICTURES ONLINE AS WE CANNOT MATCH FURS OR FUR COLORS THIS WAY-- WE WILL NEED TO SEE A SWATCH OF THE ACTUAL FUR. PLEASE EMAIL US AND WE WILL GIVE YOU THE ADDRESS WHERE TO MAIL YOUR SAMPLE(S). PLEASE CLICK THE SHIPPING INFORMATION LINK TO THE LEFT FOR INFORMATION REGARDING SHIPPING RATES. PLEASE READ THIS PRIOR TO EMAILING US FOR SHIPPING QUOTES. IF YOU CALL AND GET OUR VOICEMAIL, PLEASE LEAVE A MESSAGE AND YOUR CALL WILL BE RETURNED AS QUICKLY AS POSSIBLE, USUALLY WITHIN 24 HOURS. IF YOU DO NOT GET A RETURN CALL WITHIN A FEW DAYS, PLEASE TRY YOUR CALL AGAIN AS YOU MAY NOT HAVE LEFT YOUR PHONE NUMBER OR THERE MAY HAVE BEEN A PROBLEM WITH YOUR MESSAGE. PLEASE CHECK OUT THE ODDS AND END PAGE FOR SPECIAL OFFERS. HERE IS A SUMMARY OF ANSWERS TO OUR MOST FREQUENTLY ASKED QUESTIONS SO PLEASE READ BEFORE EMAILING!! !